What is the Apple IIgs? 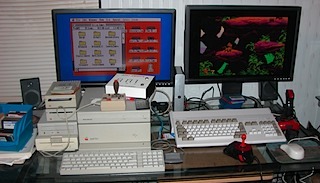 I had fun playing with the Amiga 500, eventually got it up to 4MB of RAM, 750MB of hard disk, upgraded the Kickstart ROMs to 3.1, and put a ton of WHDLoad games on the hard drive by way of RS232 and ZModem (I kid you not). Eventually I got kind of stuck with its slow speed, lack of affordable upgrade path, and worst of all, no ethernet to speak of (yes I'm aware of the rare sidecars or the possibility of adding a Zorro card, good luck with that). You can barely see it, but there it is, in 640x480 mode, with colorful icons and the enormous red mouse pointer. 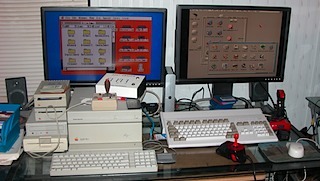 I should add that with the Indivision AGA, the Amiga 1200 can push 1024x768. Unfortunately the un-upgraded 14MHz 020 is rather pokey and it runs you out of graphics RAM. Someday I'll spring for what ebay.de (the Amiga supermarket!) calls a "turbokarte", but for now I'm satisfied with the Amiga collection. Lately I'm getting back to my IIGS video game development (what can I say, goodness takes time), using the IIGS partitions off the CF card, dumped into KEGS-OSX. I'd really like to release something, but I want it to be good. Someday.